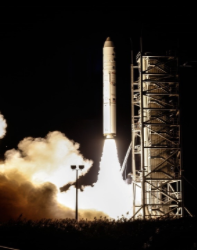 This satellite was launched in August and it is reported that all is working according to plan for the U.S. Airforce Space Command and DISA-managed network. The network relies on a telemetry downlink upgraded with greater bandwidth to communicate between the tracking station and the satellite. The upgraded downlink, currently running at the highest rate of all satellites supported by the Air Force Satellite Control Network (AFSCN), allows data to be transmitted faster. Lester Vanbuskirk Jr., an AFSCN technical advisor said that without the circuit rate increase, AFSCN could not have supported ORS-5 at the Diego Garcia tracking station. DISA first deployed network equipment at Diego Garcia in the Indian Ocean; Okinawa, Japan; and Singapore to begin the process of sunsetting its DISN Asynchronous Transfer Mode System—a legacy transport network designed to exchange information between facilities, bases, and land masses.